The City of Darien, Illinois is located within DuPage County where it ranks 27th among the 3,145 U.S. counties. Neighboring communities include Burr Ridge; Downers Grove; Lemont; Willowbrook; Westmont; and Woodridge. 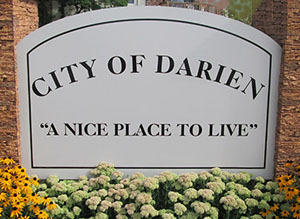 The City of Darien is located 18 miles west of Chicago in southern DuPage County. Two Interchanges on Interstate I-55 are located in Darien at Cass Avenue and Lemont Road. Within a half-mile of Darien’s western border is convenient access to I-355. Driving time to the Chicago Loop on Interstate 55 is approximately 30 minutes. Approximately 20 miles northeast of Darien is the Chicago O’Hare Airport, the world’s busiest airport. Chicago Midway Airport, Chicago’s smaller commercial airport, is located approximately 12 miles east of Darien off Interstate 55. Metra Chicagoland’s commuter rail service serves commuters from the Darien area to downtown Chicago. Convenient commuter rail stations are located within minutes from all areas of Darien. Darien, Illinois was incorporated in 1969. The city spreads 9.5 square miles with a population of 22,086 (as of 2010). The median family income is $91,880 and the average age is 43. Average home values in Darien are $265,000.00. The average apartment rentals are $763.00 monthly. For additional information on Darien Real Estate, contact a Real Estate Broker at Wenzel Select Properties. Call (630) 430-4790. If you are interested in purchasing a home in Darien, we invite to visit our property search page to look for homes available in Darien, Illinois. Darien is home to 6 elementary schools; Concord School District #63 (Pre-4), Mark DeLay School District #61 (K-2), Elizabeth Ide School District #66 (K-2), Lace School District #61 (3-5), Our Lady of Peace School (Preschool-8th), and Kingswood Academy (Pre-8). Additional elementary schools in the area include Maercker School District #60 (3-5), Holmes School District #60 (K-2), Prairie View School District #66 (3-5), Oakwood School District #113 (Pre-3), Bromberek School District #113 (3-5), Marquette Manor Baptist (Preschool-12th), and Central School District #113 (3-5). Darien’s Junior High Schools include Eisenhower Jr. High School – Dist #61 (6th – 8th) and Cass Junior High School – District #63 (5th – 8th). Other area Junior High Schools include; Lakeview Junior High School – District #66 (6th – 8th), Old Quarry Middle School – District #113 (6th – 8th), and Westview Hills Middle School Dist #60 (6th – 8th). Hinsdale South High School-District #86 resides in Darien, Illinois. Additional feeder high schools include; Hinsdale Central High School- District #86, Downers Grove South High School – District #99, Lemont High School – District #210, Montini Catholic High School, and Benet Academy High School. The Indian Prairie Library District serves the greater Darien area. The library contains numerous volumes of books, literature and reference materials. There are many programs and services for children and adults of all ages. The Darien Park District offers programs year-round. With 130 acres of parks, 15 recreational facilities within Darien, leagues, classes and other types of programs, the District are utilized heavily by the Darien community. The Park District’s newest addition, the Darien Sportsplex, is a unique facility developed through a joint partnership between the Park District and the private sector. The facility houses two ice rinks and offers instructional skating lessons. Sportsplex features a large room for parties, receptions, or meetings. The facility also has a pro-shop, field house, workout area, and a convenient food court. Carriage Greens Golf Course and Banquet Facility is located within the City of Darien. Whether you are looking for a round of golf, racquetball, or a place to hold your next party or reception, Carriage Greens serves Darien very well. Darien is also located within an easy driving distance of Seven Bridges Golf Course in Woodridge. Cog Hill Golf Complex is a short distance from Darien and is the site of the annual PGA Western Open. Stonebridge Golf Community in Aurora has hosted several annual Ameritech Seniors Open Tournaments.